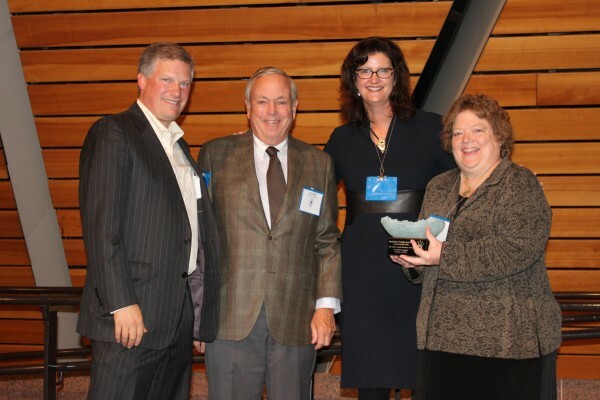 The Northfield Public Schools Community Services program, Connected Kids, was one of four in the state to be honored by the Mentoring Partnership of Minnesota (MPM) at a celebration on Oct. 14. Two metro and two greater Minnesota mentoring programs received the Bob Dayton Quality Mentoring Award for committing to high-quality mentoring opportunities for youth and volunteer mentors and for meeting the criteria in a specific category. Qualifying in the award’s innovation category, Connected Kids was recognized for demonstrating program stability and strong management, operations, evaluation and design features. Connected Kids, in partnership with the Northfield Mentoring Coalition, is a school-based mentoring initiative that pairs adult volunteers one-on-one with students. Mentoring helps youth to develop strengths and talents by providing friendship, encouragement and guidance. Outcomes of the program include improved academic performance, improved attendance and community engagement in education. “Mentoring programs that make a commitment to quality help young people stay in school, go onto post-secondary education and become contributing adults,” said MPM’s Executive Director, Joellen Gonder-Spacek. “We are proud to acknowledge the impact that these exemplary programs have had on thousands of young people’s lives,” she said. MPM was formed in 1994 as a community initiative to promote mentoring for Minnesota youth. MPM supports a network of more than 400 youth mentoring programs through training, technical assistance and marketing. It hosts the region’s only annual mentoring conference focused exclusively on supporting quality mentoring.